Things we learned in France. The city is gorgeous. We had a chance to walk around a little, have breakfast in a little quiet cafe, have dinner in a restaurant away from touristy places, and watch people. French people are very nice. Everyone we met was very nice to us. We opened with “Bonjour” followed by “Parlez vous anglais?” and most of the time people spoke English. For some weird reason, probably because of Gordon, people kept assuming we were British and when we told them we were from Texas, we got big, surprised eyes. French taxi drivers are insane. If you ever want to have your life flash before your eyes, take a taxi that goes through the round-about at Arc de Triomphe. It’s an eight lane round-about. There are no lanes. I repeat, there are no lanes. It was like riding in a bumper car, because everyone slams on their breaks, cars go perpendicular to each other, and bikers and scooter riders completely ignore the fact that they are a vehicle and zip between the cars with fractions of inches to spare. Also we saw taxi drivers and hotel staff almost come to blows over some sort of dispute regarding taking payment by credit cards. It was hilarious. A lot of store windows around Arc de Triomphe were smashed. Security was everywhere and all the bags had to be inspected. We asked one grim looking security guard about the windows. Their casual is our formal. There was a lot less kin – although it was pretty cold. If you are a woman and you want to look like a local in Paris, put on dark jeans or pants, preferably ankle length, a business casual blouse, a jacket or a cardigan, and a scarf. Seriously, 50% of the women wear some variation of this. You haven’t had a croissant until you had it in France. Seriously. I don’t know what they put in them, but they are insanely good and I don’t even like croissants. They are. So many people came out to see us. Some many people told us in fluent English how terrible their English was and how much they loved our books. Hundreds of readers came by to see us and when the signings were finally done, we were left with a small mountain of chocolate and sweets presented to us. Thank you to everyone. You guys were amazing. We also met Luisa Pressler, who created Kinsmen art, and her partner, Klaus Scherwinski. We had some productive business discussions and we might be bringing something new to you in Kate Daniels’ world. So what’s next for us? We are diving into the edit of the Sweep of the Blade. We are hoping to have it available to you in early summer. The first Saturdays were about “revolution”. Now it’s the 20th (this is a real number) and the shops are closes, windows smashed, cars burnt by “casseur” (breakers/hooligans), not by the gilets jaunes and the government does not know how to handle this situation. Quite sad as lots of shopowners near the Champs Elysées are in financial difficulties as no Parisians nor tourists want/can go there on Saturdays because of the violence. As for the croissants and as many readers have commented… French butter is the best and is definitely the key for making croissants (quantity and quality!). Anyways Paris is beautiful and glad you enjoyed it. Maybe next time I will manage to go to one your signings ! Oh boy. Paris croissant. Life will never be the same after them. They are a slice of heaven. The ones with chocolate inside….I still dream of them. I am glad you enjoyed your trip. It sounds marvelous! 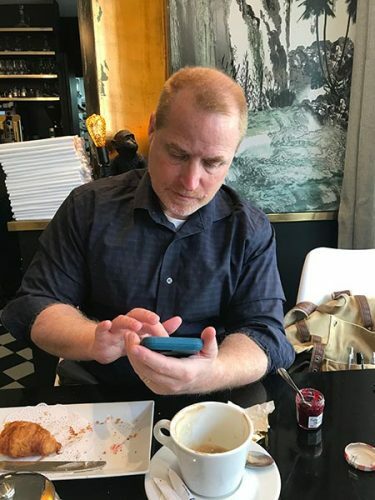 I was just reminiscing about pain au chocolat! YES! I adore Paris. I was last there for their Labor Day. 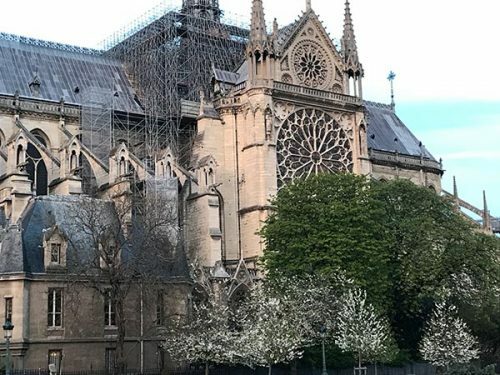 It is true that Paris in the springtime is incredibly beautiful. And muget de bois are one of my favorite flowers. Sigh. The secret ingredient in the croissants is butter! Come back to Atlanta. In the suburbs there’s a french bakery called Douceur de France in Marietta and Roswell. Not sure how true this is, but it’s certainly a fun explanation of French driving! Yes, France, in general, is AWESOME!! Hummmm thinking Kate would make a great video game? Yes! Like assassin’s creed? Or a really amazing graphic novel? We did not find most French people in Paris as friendly to us as you did on your trip. My daughter Emily was received with joy everywhere because they thought she was a French model! We were followed off an escalator by a male soccer team! Sheesh! The pastries were, a you reported, phenomenal! We stayed in a small locally owned hotel (elevator only held one person at a time!) with breakfast included in room price. The breakfast consisted of delicious coffee or tea and a basket of plain and chocolate croissants. Needless to say it became our favorite meal! At the Arc round about we actually saw a person on a bicycle get knocked off the bike by a car! He quickly jumper back on and rode off! To ride a bike there imo is to have a death wish. Glad you enjoyed your visit. I didn’t know you were coming until yesterday and it was too late. Maybe I’ll have more luck next time! Yes, croissants! Cafe au lait! Breakfast of champions…. Then dinner with (fill in blank) and pommes frites, merci a tout! Dessert: Sweep of the Blade. Yum. I loved Paris, even in December it’s nice. The butter is key to all the pastries and the chocolate is to die for. I’m glad you two had a wonderful time. The only issue I had was everyone was amazed that the only coat I was wearing was a hoodie style light jacket. I had to keep telling people that where I came from 45 degrees is actually warm for that time of year. So….will you be working any of your observations or scenery into upcoming Hugh books? What a wonderful trip; it sounds like just what you needed to ease back a bit. 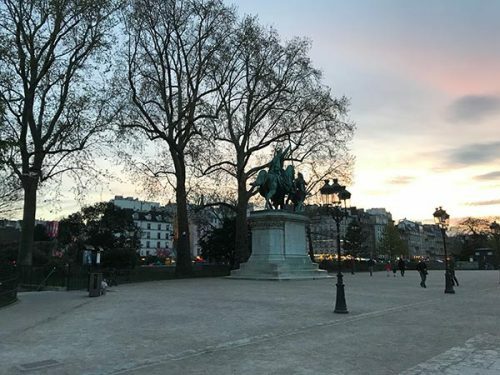 Thanks for sharing a glimpse of Paris in the spring. Oh boy, I will be on my way to France and was researching how to dress less like a writer in my living room and more, you know, without ze sweatpants. Part of the difficulty is (and I realize this doesn’t sound like much of a difficulty) that I’ve spent much more time in Italy being a history and art nerd. I realize much to moi horror, That all my scarves are wrong. The French are into square scarves tied in a little knot around your neck. The Italians are into long scarves folded in half and neatly folded in the front. And I have a lot of them since you can buy them on every street corner, really nice ones. (OK, in Florence.) The other problem is to tuck or not to tuck. Italians always tuck their shirts in. I’ve only recently heard of what is called the ‘French tuck’ where you just tuck in the first few inches of your shirt in front and then let everything else hang out. Also little striped black and white shirts are actually in. As in – everyone has one or two or three. Usually I’m able to go to a place and no one guess’s I’m American. I get comments like “Oh but you are so polite for an American did you live elsewhere in Europe? ” Is it TV or are we really that awful? But mon Dieu, I am afraid this will be a lost cause as my command of French comes from the names of perfumes which I collect. So I know water, air, fire, rose, beautiful, rain, innocence, girl and nice. I need to learn ‘Knitting Store’. So, I shall simply drop the name Ilona Andrews – as obviously you have many, many fans in France so there should be no problem. Thank you for all the things you do for us fans, all over the world. Also- my book withdrawal is so severe that Im going through all the Kate books for the, um, 6th time? Oh great Authorlords- I have much yarn and perfume, I make an offering….? 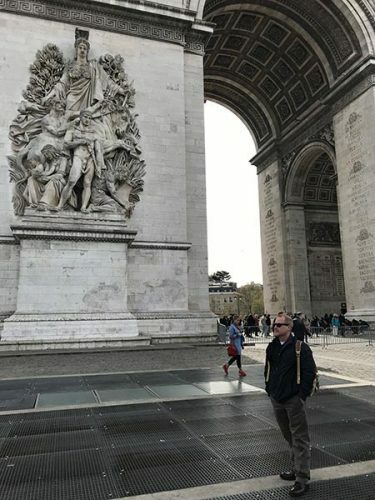 I am so glad you had a great time in Paris. I am half-French (my father is from Normandy) and I get really annoyed when Americans tell me they hated Paris. It’s fine to hate Paris, not everyone will love it. But the “I hate Paris” is usually accompanied by “French people are so rude!” and usually the people in question only visited Paris and nothing else in France. Paris does not represent the entire country. The fact you said the magic sentence “Bonjour, parlez-vous anglais?” makes me so happy because those 7 syllables will open doors. As for all the rioting, it started with the Gilets Jaunes and I get it kind of splintered off from that. Also French taxi drivers will often refuse payment by credit card because they get taxed on it and will often only take cash and lie and say their credit card thing is broken. Which is why you witnessed that argument. Their business is suffering as more people are taking Uber as it is less of a hassle. And as you said nothing beats a real French croissant. However Costco has some decent croissants and they are the best I’ve had in the US. Nobody believes me when I say it but it’s true! So glad you had a great time with your French readers 🙂 and I hope you get to return to France again someday. 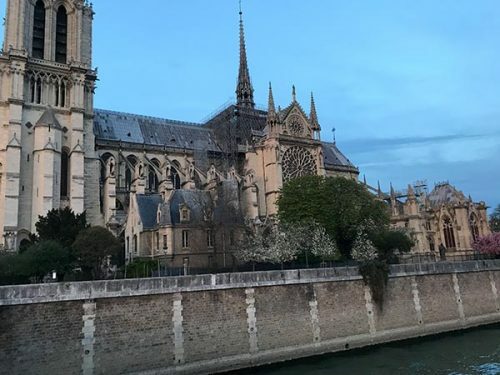 I had to revisit your pictures of Notre Dame. I can’t believe you were just there. My heart is breaking. Thanks for these pictures. I know it is horrible! 850 year old beautiful church in flames today. They think it may be related to the renovations that were going on there. 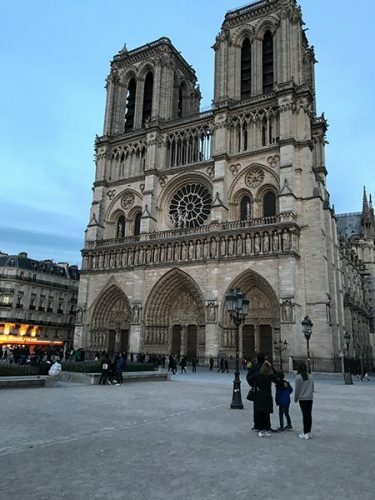 I came back for the Notre Dame pictures too. I can’t believe it’s burning. What a loss to the world. Ps you nailed it on the fashion here (big scarf fan here, plus I have a stupid cough that doesn’t want to go away). Can’t beat the classics !